This information card, produced by the New Zealand Post Office, was provided by Alex Glennie ZL4ACG. It appears to have been intended as a handout to radio station visitors, as it concludes with “Hope you enjoyed your visit and found it informative”. We would appreciate any information about this card, such as when it was produced, who designed it, etc. 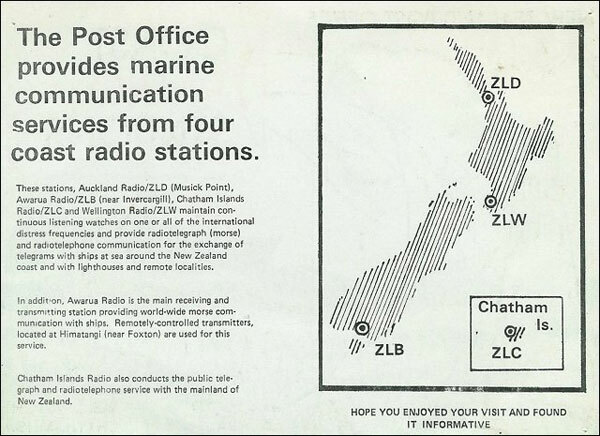 Front of the card about New Zealand Post Office coast radio stations. Date unknown. 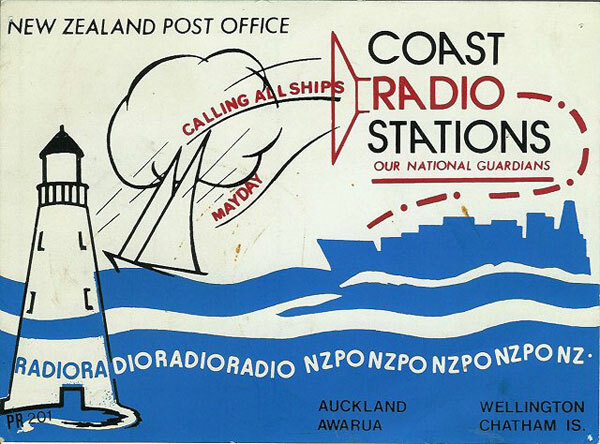 Rear of the card about New Zealand Post Office coast radio stations. Date unknown. The Post Office provides marine communication services from four coast radio stations. These stations, Auckland Radio/ZLD (Musick Point), Awarua Radio/ZLB (near Invercargill), Chatham Islands Radio/ZLC and Wellington Radio/ZLW maintain continuous listening watches on one or all of the international distress frequencies and provide radiotelegraph (morse) and radiotelephone communication for the exchange of telegrams with ships at sea around the New Zealand coast and with lighthouses and remote localities. In addition, Awarua Radio is the main receiving and transmitting station providing world-wide morse communication with ships. Remotely-controlled transmitters, located at Himatangi (near Foxton) are used for this service. Chatham Islands Radio also conducts the public telegraph and radiotelephone service with the mainland of New Zealand. Hope you enjoyed your visit and found it informative.